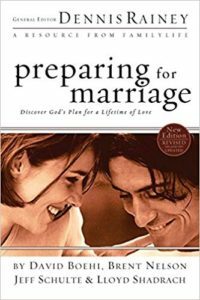 Dennis Rainey’s book, Preparing for Marriage, is a dynamic, comprehensive program designed to help you prepare for life together after the cake is cut and the guests head home. That is when the real adventure begins–the adventure of creating an intimate, lasting, and biblical marriage! Inside you’ll find eight sessions of fun, romantic study that will help you target areas for growth in your relationship. You can work through Preparing for Marriage as a couple, with a pastor or premarital counselor, or with a small group. Don’t just plan your wedding . . . prepare for your marriage! Work through this section very carefully and add as much detail as possible. This will help you further evaluate who you are and how that will play into your marriage in further chapters. What do expectations for marriage look like and where do they come from? Discover and discuss if you are an optimist, pessimist or realist in your expectations of marriage and how that can affect your relationship. I recommend going through as many personality profiles and character assessments as possible to better understand who you are apart and together. You can find these under additional materials. God has a very simple equation for marriage: one + one = one. It’s revolutionary but once you understand it you will have an entirely new perspective on what marriage is meant to look like. There are four commitments in the book of Genesis to building a marriage according to God’s blueprint. This chapter is meant to help you evaluate your relationship and think through some important topics before making the big decision. These questions are good to go through whether you are seriously dating or already engaged. I recommend taking the 5 Love Languages by Gary Chapman test during this chapter. Talk about your love languages, evaluate how you receive love best and communicate that to your partner, listen to how your partner receives love best, and determine 3 practical ways in which you can love your partner better. Why do you think many couples experience so little conflict during courtship or engagement? Many couples believe that they have strong communication. Authentic communication is more than just talking. Household roles and responsibilities look different for every couple. Discuss what “submission” means in Ephesians 5:22. What are the husband’s responsibilities according to the church? The wives? I strongly encourage couples to read Philippians 1-4 regularly. One of the hardest test a marriage can and will go through is financial struggle or even abundant wealth. It isn’t the lack of money or excess of money that causes a marriage strain but the lack of communication about it. If God is the owner, what does that make me? I encourage couples to complete one of the two bible studies, Navigating Your Finances God’s Way or Money and Marriage God’s Way, with Compass Finances.